Meine Damen und Herren, auf Gleis 12, I-C-E 540 nach Köln Hauptbahnhof, planmässige Abfahrt um 2106 Uhr. Wegen der Schnee, Glatteis, und technischen Störungen, entschuldigen wir uns für die Verspätung, und wir bitten Sie um Ihr Verständnis. Ladies and gentlemen, on platform 12, InterCityE xpress train 540 to Cologne Central Station, with scheduled departure at 2106. Due to weather and technical problems, we apologize for the delay, and we ask for your understanding. 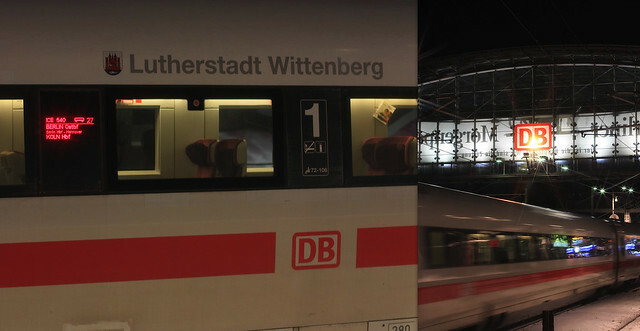 Throughout most of December, snow and ice continued to be a thorn in the daily and timely operations of the primary Germany rail operator, Deutsche Bahn. According to the Deutsche Bahn website, the ICE train from Berlin to Cologne takes a little over 5 hours in good weather-conditions. On this Boxing Day evening, this train left Berlin about 10 minutes late, and there was a lot of snow along the way between the capital to the Rhine-river region. I’m sure this train arrived in Cologne at least an hour late at 3am. I made the photo above on 26 December 2010 with the Canon EOS450D camera and EF 50mm f/1.4 USM lens. Published initially on Posterous, this post now appears on Fotoeins Fotopress at fotoeins.com as http://wp.me/p1BIdT-Q.